Sydney came to help too, but she had a sleepover. She is going through a tired and hungry phase right now. We are going to rent a floor sander and try to make some of the hardwood scratches a bit better. Sydney's room is the worst. If it is a complete fail, she will be getting tile instead. Hoping that the linky tool will be nicer to me today. Wish me luck! Mari was scheduled to post a block next week, but she had it ready early and offered to have it up this week instead. I gladly took her up on her kind offer! 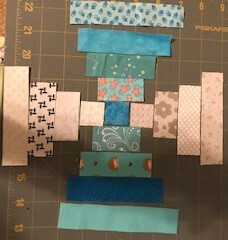 She has made a Spinner block for us all to try. It is super cute. I can't wait to make one. 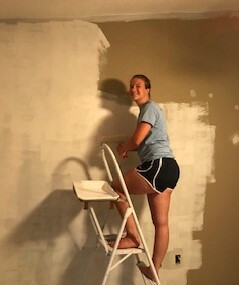 Falling a bit further behind each week with house showings and painting of the new place, but everything is moving along well and I can't complain about an abundance of productive effort that is moving us toward settling into our new home. Transitions are difficult for everyone, but it will have me sewing away in a new studio before you know it. So for now, please go visit Mari and tell her thanks for another great block! For now, I'm recovering from 2 days away from school and hoping to get caught up any day now. 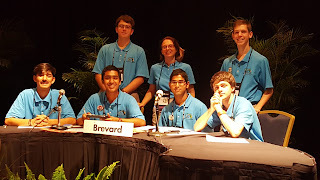 Just 16 school days until the end of course exam for my little guys and 19 before the the AP test for my bit buckaroos. Deep breath an moving on! At the state academic team competition this weekend and working to get the new inlinkz to work. Wish me luck. I don't seem to be having much luck with the linky party again this week. Is there anyone who has successfully navigated the freshlinkz system who might have some words of advice? When I finish creating the link, there is a box for the party on the dashboard, and at the bottom it says "copy code" When I try to copy the code, it asks for a blog URL, and when I enter my blog, it tells me that "this url has been taken" I've tried it for the main blog url as well as the specific url for this post. Has anyone else run into this problem? I finally heard back from tech support last week to get the new account activated, but waiting another day and half for them to help would be a bummer. Hey, maybe I got it to work. I pasted the link into a new tab and copied it back to this post. I'm sure that is not how it is supposed to work, but there seems to be a linky here now. Sorry to be having such trouble. Usually I can navigate these things pretty easily. Not sure why I'm having such fits right now. Probably because I'm trying to rush through everything. That is always when it gets hard. We lost our first match yesterday and therefore have to play a consolation round to earn our way back into the competition. Wish us luck? Winning is so much more fun than losing. We went to Epcot last night after our match and it was beautiful! They are having a flower festival right now. We were able to get in all the main rides and see all the sights before the big light show at 9. 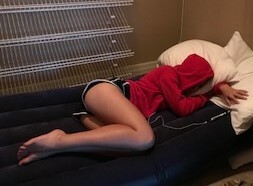 I was ready to sleep after all of that, though the kids still seemed to be going strong. We have brunch first thing and then maybe a quick park trip before the match and then more park time of course. I think Animal Kingdom is the plan for today. It is one of my favorites. The new Pandora is just breathtaking. We found two new windows at the new house. They were all covered with drywall and we didn't even know that we had them. Kurt has been creating lots of dust while taking out the drywall. 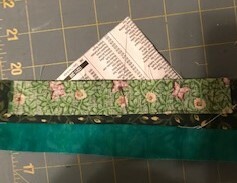 I haven't had much time to sew, but at least I got to use my quilting supplies to cut shelf liner. There was lots of very old and grubby contact paper that I am replacing. Painting is happening slowly. Most of the priming is done, at least on the main floor. I got one gallon of our possible color up to see how we like it. It is a Benjamin Moore color called Balboa Mist. What do you think? This is the color from before. We are replacing the light fixtures too, and the baseboards. One project at time though, slow and steady. 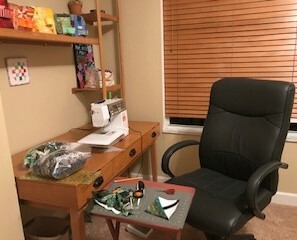 I'm hoping that the dust making ends soon and I can set up a sewing room. That will be fun! I'm enjoying classic patterns lately. Today's block is a simple variation of a log cabin with the color placed ever so slightly differently. 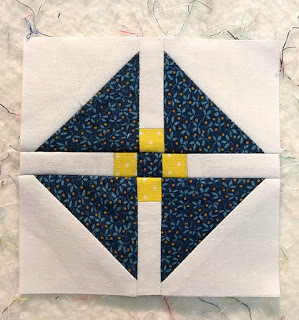 The advantage of this layout over a traditional log cabin is that you can add two log on each round before you have to iron rather than just one, which makes things go faster when you are sewing just one block. Each log or step on your block is made from a 1 inch strip cut in an even increment of 1 inch. That makes it easy to cut and to keep track of. 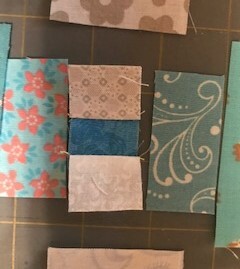 I decided to use the aqua fabric for the center, but either arrangement would work. 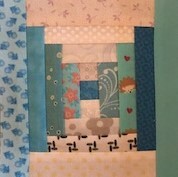 First, sew a white square onto either side of the center teal square. Press the seams away from the center. 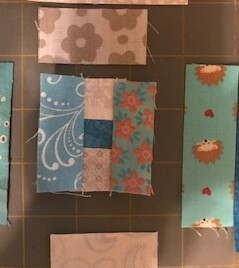 Next, add a 2 inch step onto either side of your center squares. If you are using a perfect quarter inch seam, the steps should match the size of the center unit perfectly. Now is a great time to adjust your seam if it isn't quite right. I kept finding me steps just a tad short, meaning that my seam was too narrow. I adjusted ever so slightly on the next round and all was well. 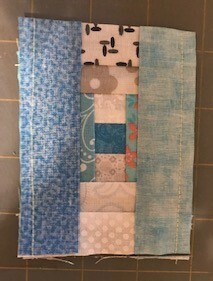 Continue to add steps to either side of your center unit, pressing the seams away from the center with each addition. On the third round, I started to find my steps just a tiny bit short again. 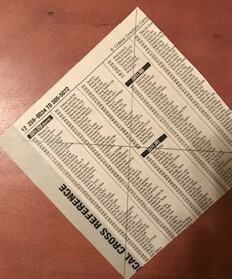 I trimmed the edges gently and tried to make sure the next round was spot on. 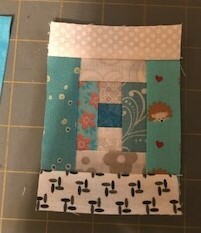 The final block should be 5 inches square. 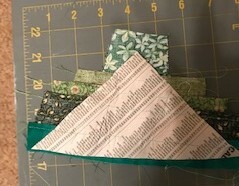 It has lots of pieces, but with careful sewing, it is a pretty straight forward block to sew. 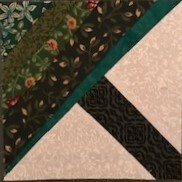 It should be set diagonally in the final quilt. Sorry to be off to such a late start this morning. InLinkz has been giving me fits. I've been working on the old version because I never wanted to take the time to switch over. Today the old version finally stopped working all together and I can't get the new one to work. I'll get that figured out ASAP. Until then, I'm on a temporary account. We got the ceilings painted on the main floor of the new place this week! No more offers on the old place yet. I was hopeful when someone wanted information on the age of the water heater and amounts for all the utilities, but then they went on their merry way. Kurt is off for his dad's wedding this weekend, but the rest of us weren't able to go. Tomorrow is prom for Ryan and he is super excited (on a Ryan scale that means he gave it a "neat"). I have a ticket in with the linky service, until then, I've used the free version to create a text only linky. Yikes! Sorry for the bother. I've been procrastinating on switching over until things calm down. Calm may not be happening around here for a while. Plans change in a hurry. 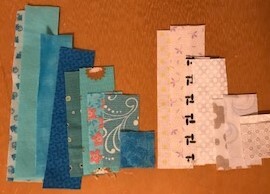 The house was sold and I dared to leave a sewing mess out from the Tiny Tuesday block. Then we got a call that the offer had fallen through. Apparently the very nice couple that was moving from Colorado isn't coming to Florida after all. So our house is back on the market again! We had a showing yesterday and two more for today. I think that is pretty good given that the listing had been removed or changed to contingent from all the listing services. So no sewing for me today! We'll be off working on the new house instead. Thanks so much for all the good wishes! I'm still so excited about the change and sure that it will all work out in the end. Things usually do. I know it is Wednesday. Its been a week! Today it stormed. There was driving rain and hail. It was quite dramatic as the kids rushed from class to class getting drenched. I was inspired to make an umbrella block in response. 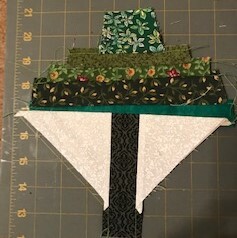 I wanted to make an applique umbrella, but the only fabric I could find in my freakishly tidy sewing room was the green string bag. I am so happy that we have an offer on the house and can stop pretending that we live in a model home. Perfection is exhausting! In any case, here is a string umbrella block for you all. Find a scrap of paper and trim it to about 5.5 inches. Draw a line from corner to corner along each diagonal and cut the square in half along one of those drawn lines. Center the black strip along the center line on one piece of paper. I had a strip that was 1.5 inches, but I wish I had used something a bit narrower. 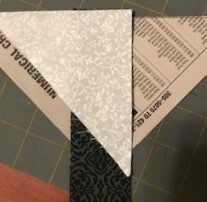 Place the triangle right sides together on top of the block strip. Before you sew, check to see if the fabric will cover the paper when it is sewn in place. 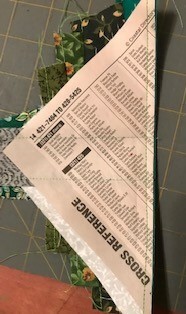 Sew the white triangle to the black strip using the phone book paper as a foundation. Open up that side and repeat with side 2. 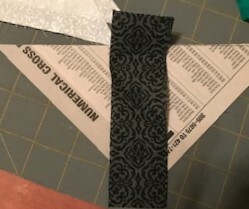 Press the half square triangle and trim the top edge so that it is even with the paper. Set this aside for a moment. 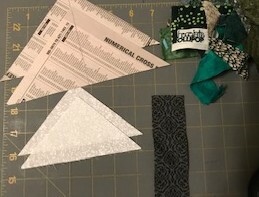 Now grab the other triangle and use it a base to make a half string block. 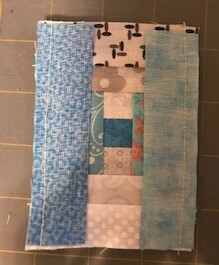 Press each strip before adding the next. 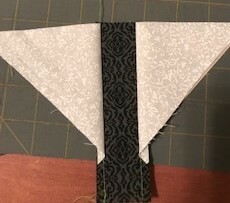 Continue to add strips until you reach the tip of the triangle. Use a slightly wider strip at the end or a triangle if you have one handy. Place both triangles right sides together along the hypotenuse making sure to match up the center points. 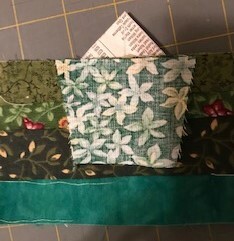 Press the center seam open or toward the less bulky side of the block. 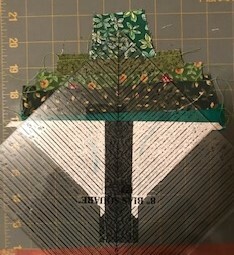 Trim the completed block to 5 inches. This block will be set on the diagonal which will leave the umbrella upright and ready to protect you from an unexpected spring shower.